It's a question many an accounting student has pondered. Or just plain guessed at. But that's a pretty complicated definition. The owners equity is simply the owner’s share of the assets of a business. The owner himself (owners equity). Owners equity, often just called equity, represents the value of the assets that the owner can lay claim to. It's the value of all the assets after deducting the value of assets needed to pay liabilities (debts). 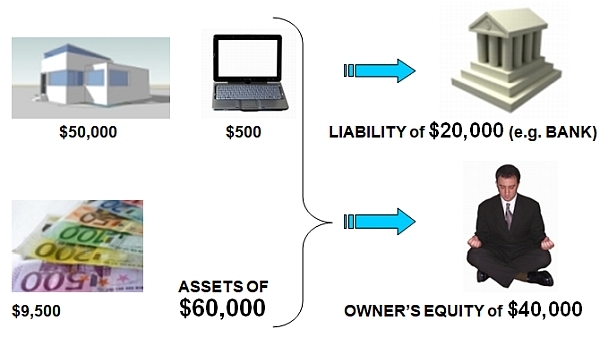 In the diagram above, the assets amount to $60,000, but the value of the assets the owner can lay claim to is only $40,000. This is because there are liabilities (debts) of $20,000, so $20,000 of the assets will be needed at some point to pay off these debts. The value of the assets that the owner really owns. Since we've now defined all three of the elements of the accounting equation, including owner's equity, we can look at this equation now with a bit more insight. So, what does the basic accounting equation really represent? The accounting equation indicates how much of the assets of a business belong to, or are owned, by whom. Well, that's all we're going to cover in our lesson on "What is Owners Equity?" Hope things are starting to make more sense now! In the final lesson of this section (basic accounting concepts) we're going to relook the accounting equation and introduce a brand new concept. Click here for the next lesson - the accounting equation and financial position. Owner's equity is also called.....? Owner's equity = ? + ? - ? I need answers for this question. Please help! If an owner invests more money into the business do the assets increase or liabilities increase?